Extrusion machinery manufacturer battenfeld-cincinnati (Foshan) Extrusion Systems Ltd (battenfeld-cincinnati China) was founded in 1996 and has been exhibiting at Chinaplas every year since then. At its 20th Chinaplas, battenfeld-cincinnati China will feature its LeanEX PO pipe extrusion lines as well as twin screw extruders from the twinEX series and a range of extruders and roll stacks for thermoforming sheet production. All these solutions for pipe, profile and packaging will be showcased in Hall W1, Booth Q21. The main feature of the exhibition is the LeanEX series, which was designed for standard PO pipe extrusion. Complete lines are available for diameters up to 630 mm. At the booth, the largest of three extruders, the LeanEX 90 will be presented. LeanEX has attracted a lot of attention from domestic pipe manufacturers since its launch in May 2009, due to its high efficiency, excellent pipe quality and cost-effectiveness. LeanEX single screw extruders are built at battenfeld-cincinnati China using European technology, selected European components and locally sourced screws, barrels, motors. 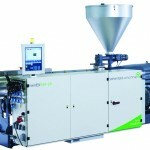 The three available extruder sizes 60, 75 and 90 mm provide high performance with low energy consumption. Outputs range from 350 – 800 kg/h for HDPE and from 280 – 600 kg/h for PP-R. The second extruder exhibited at the booth is the twin screw extruder twinEX 93-28D, which was recently introduced in China. 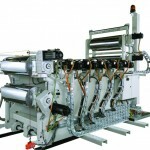 The machine can be used for profile, pipe as well as PVC sheet extrusion. In the past years, profile producers have become more and more environmentally conscious and are demanding highly energy-efficient products. Thanks to 40 years’ experience in building twin screw extruders for profile extrusion, battenfeld-cincinnati’s twinEX extruders offer substantial cost and material savings. Especially in times of rising raw material costs, this is very important. Depending on the application, the outputs range from 115 kg/h to 2,500 kg/h. battenfeld-cincinnati China also offers equipment for the demanding thermoforming sheet market. At Chinaplas, a large display will introduce the Multi-Touch roll stack, which is an optimal solution for producers who are not prepared to compromise on sheet quality even at high line speeds. Thanks to an innovative concept, a high degree of transparency, excellent flatness and an extremely even sheet thickness can now be achieved for a great variety of materials, such as PS, PET or PP, as well as EVA or laminated products. High-speed single screw extruders complement the Multi-Touch roll stack, adding a solution for high-end applications in terms of both quantity and quality.